Web2PDF Online is a free online coversion service that allows your visitors to save useful content from your site or blogs to PDF files. I saw the icon while I was visiting Digital Inspiration blog. Pownce is a way to sent stuff like messages, musics, links, photos and events to your friends. Pownce is a micro-blogging system build by Kevin Rose, founder of Digg. You can also sent stuffs by Pownce desktop software. Recently, I’ve been invited to Pownce and I got another 6 invites. If you want a Pownce account ? Leave a comment here with your email address which will be used to sent invitation. I just noticed that w3 XHTML validator’s design changed in these days. New gray design has fade in/out feature when switching between URI, file upload and direct input tab. But CSS validator and feed validator remain with old design. 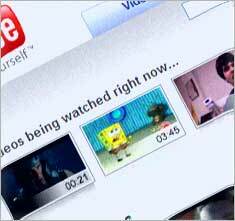 YouTube is available now !!! Here I took snapshot this morning. I can still access YouTube from my Office. Connection is very slow when browsing YouTube main page. But playing video is not slow. I’m not sure this is ISP’s server problem or other ISPs they still don’t get permission from Thailand’s Government to unblock YouTube.com from blocked list. But for now, we’re going to inform to ISP about this serious case, yeah this is serious case, and want to know whether YouTube is available here from now on or not. What I noticed is that I can see all the thumbnail from YouTube in both Google Search and Google Video search since last two weeks. But I couldn’t access to YouTube directly at that time. But I don’t know why I can see all the thumbnail images from img.youtube.com server since the whole youtube.com server is blocked. But I stopped browsing according to policy is being stated here. Though I’ve seen a Kramer plugin that can add inbound links from Technorati as trackback/pingback comments, I created my own one for my blog. Reason why I created it to get incoming backlinks from other blogging system (sometimes you’ll probably lose trackback even in same wordpress system, as screenshot said.) and to practice XML especially dealing with web APIs. Wobzip is an online uncompression which let you to uncompress zip file on the fly. It supports multiple format like 7z, ZIP, GZIP, TAR, BZIP2, RAR, CAB, ARJ, Z, CPIO, RPM, DEB, LZH, SPLIT, CHM, ISO (some of them I’ve never heard before). 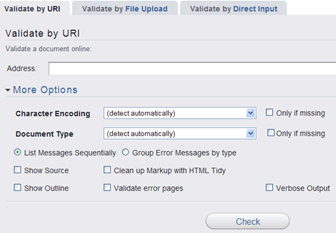 You can upload file from your machine or directly refer to the url of the zip file to uncompress. Currently, Wobzip is still in development and maximum upload file size is 100MB. It is good for those who want to unzip file when the machine doesn’t have unzipping software like WinRAR or WinZip. Last week, friend of mind asks me that where he can get FREE PHPBB templates. I was looking around and googling in internet. I found a lot of nice and cool PHPBB templates. I visited those sites, downloaded and tested the following templates in my machine. (Currently, I’m using PHPBB 2). Then I list those sites and mailed back to him. But what I remembered is that some also need template for their PHPBB forum and may be they’re still looking for right PHPBB template. So I make a post and took screenshot and listed in my blog. I hope this post will help you who’re looking for PHPBB template. Sometimes, It is not good to see the following message when some of your visitors check your web page with W3 XHTML/HTML validator. I used to do mistakes about XHTML and CSS when I start learning web programming. Normally, I wrote an application and run in browser and check whether it works or not without looking up my web pages are XHTML valid. And CSS too. But I do care when I start learning XHTML, CSS and blogging especially creating theme for wordpress. Now I want to share my knowledge about XHTML and it’s some tags that can change your my web not validated XHTML. 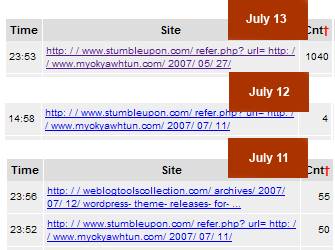 After submitting 11 web sites for web designer post in StumbleUpon On 9th July, 2007, now my Mybloglog status shows that I’m getting a lot of visitors came across from StumbleUpon. nowadays people are more likely to share and save list articles in social bookmarking sites. p.s: 12 other stumblers (updated: 13th July, 2007) also submitted that post in StumbleUpon as I noticed. And also I’ll never try to do like this in future in order to get traffic.